The Broncos looked out of sync at home Sunday despite beating the Baltimore Ravens 19-13 on a last minute interception. Thursday they will look to get to 2-0 as they travel to Arrowhead Stadium to play the 1-0 Kansas City Chiefs. Denver QB Peyton Manning failed to throw a touchdown pass and put up just 4.4 yards per attempt in the win over the Ravens, and overall the Broncos offense just looked old. They got the luxury of having a great night from rookie kicker Brandon McManus, who hit on four field goals, two from beyond 55 yards, and may have been the best player on the field in the 6-point win. The Broncos defense stepped up to make sure the Ravens wouldn’t rally for the win. Denver limited the Ravens to 173 yards while coming up with two huge second-half interceptions of Joe Flacco. Aqib Talib returned the first 51 yards for a go-ahead touchdown late in the third quarter and Darian Stewart sealed the win with an interception at the goal line with 28 seconds left. Manning, who said after the game the Broncos offense was a ‘work in progress,’ threw for 179 yards at Kansas City back on November 30th, but threw two touchdowns and the Broncos rushed for 214 yards in a 29-16. The Broncos have won four straight at Arrowhead, and are 17-1 against division opponents since Manning came aboard in 2012. Alex Smith and the Chiefs got off to a great start Sunday in Houston, as the QB threw three first-half touchdown passes and the Chiefs were penalized just twice in a 27-20 victory. Travis Kelce had two touchdown catches and put up 106 yards on six catches, while offseason addition Jeremy Maclin added five receptions for 52 yards to support 103 yards from scrimmage from running back Jamaal Charles. 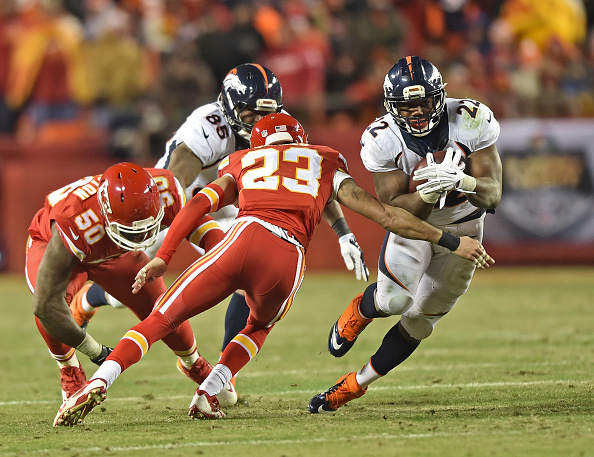 The Chiefs defense should give fits to Manning and co. and with the Broncos run game in doubt with Anderson banged up, points for Denver could again be hard to come by. Look for the Chiefs to finally get one on Manning, as Kansas City should be able to use their balanced offense enough to pound out 17 points, which will be enough to kickoff week two. There are tons of great games and cash prizes this week in the NFL – get into the game with great one day fantasy leagues that can get you paid the next day – play now! The KC qb smith should Knitting.Big BEN IS BETTER ON ONE lEG! !